This had to be the best organised event I’ve ever been to! 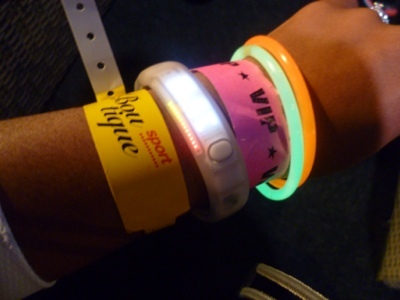 I was lucky enough to be in the VIP area but the entire event seemed to run like clockwork. The venue was spectacularly dressed with a bar and food available for purchase. 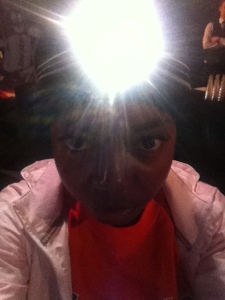 Upon arrival, we picked up our T-shirt, headlamp and glow sticks…the final touches to ensure we lit up the night! After relaxing for a while in the VIP area, we headed over to the Boutique Sport area to catch up with friends before the race. From the venue to the start line took about 2.5 minutes and we were off! I could hardly believe it! 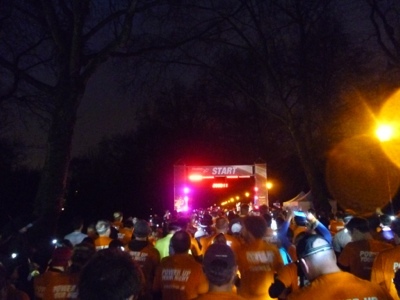 For Run To The Beat last year we stood outside in sub zero temperatures for almost an hour before we could set off! The after party was decent! Great music and great atmosphere! Most likely due to plenty of people celebrating PB’s including myself! …I dined on popchips and drank plenty of red wine…a recipe for an early night! 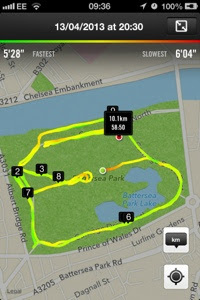 I ran using Nike+ so this didn’t really affect me but I found the distance markers were not very clear! I guess I’m used to half dressed men on podiums which we had at the Boutique Run in the summer of 2010 and 2011! Although it was a fun run, it seemed a lot of people were taking it very seriously and there were a number of discourteous runners! Around one bend early on in the race I had one guy cut me up; I’ve seen the damage falling flat on your face can do and there was no way I was gonna be put out of the game by an inconsiderate guy! That doesn’t seem to happen at the female only events so I guess it’s something I may (but shouldn’t) have to get used to if I run in mixed events in the future. And guess what?! …it rained! even though the weather forecast was for a dry evening the great British heavens opened up and down poured on us! It wasn’t so bad though (especially when compared to the 2012 British 10km) it was actually quite refreshing! The biggest thing that bugged me, was the link to social media. I ran through the Power Seal tunnel at around the 2 or 3km mark (not where I was expecting it) and then through the Power Boost tunnel during the second half of my race. It seemed though that the messages only posted on FB and twitter about 3 hours AFTER I had actually run through the tunnels and didn’t distinguish between Power Seal and Power Boost! 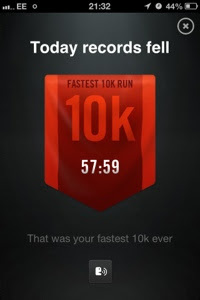 Hmmmm…Thanks to everyone that did comment, “like” or RT the posts…I’m just grateful for Nike+ and the cheers I received via that app which actually helped keep me going through the race! 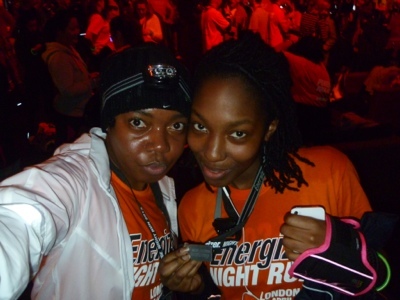 Water was available at the 5km mark…great…we had plenty already albeit unbottled! 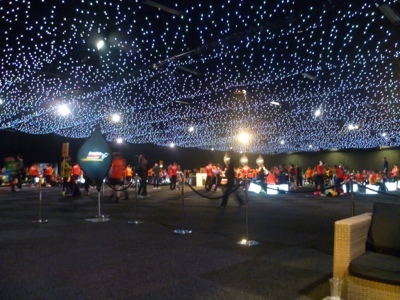 …At the end there were tables with carrots, water and medals. Being excited to have finished the race I kinda ran straight past the medal table then spent 10 minutes trying to get back and grab one! …Erm, where were the people handing them out?! It was just self service! …the after party made up for this though! 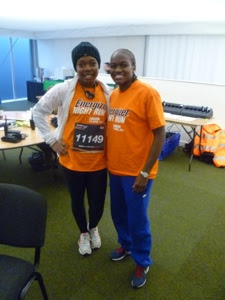 The first 3km I ran with my friend Alicia. We were supposed to run the whole 10km together but she decided she was just gonna run 5km and told me to go on without her. Having been a bit stop starty in the first 3km trying to encourage Alicia I think this made it more difficult for me. Between 5km and 6km I was seriously considering giving up. Then I found my stride again until about 7.5km when it started getting difficult again. I think I was running a bit too fast, which made me have to slow down when I should have been running a more constant pace. At that point I saw Leah (of Naturally, Leah) who seemed to be running a constant pace so I stuck behind her for the last 2.5km which worked well even though it felt like a struggle! Throughout the run I tried to focus on technique and my breathing which I think really helped! I am VERY happy with my time of 58:18. I think it kind of takes the pressure off for July which I am now very excited for! All in all, I had a fantastic time! …I’m hoping I can be in town again for 2014 (you can already register your interest!)! But that is not all! 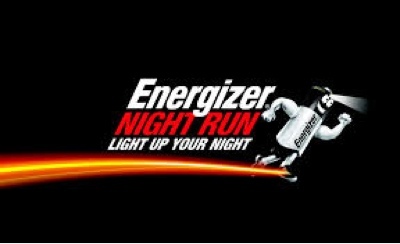 …I had the pleasure of doing an interview with the Energizer Night Run Ambassador (and 2012 Olympic Gold Medallist!!) Nicola Adams on the night! I think I was more nervous about that than the actual run! 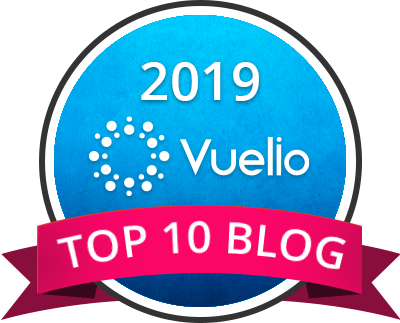 Come back soon to read the full interview…. Would Consistency Make You A Better Runner?